AAaaaawww, Tif! This is so cool! Oh! Those are 2 cute! Mr. And mrs. Monkey look so happy living there in your precious home!!! Wow! How amazing! I wondered how you got the monkeys to stay attached to the tray when it was vertical... very clever indeedy! Wonder what international postage would be on a tray????? 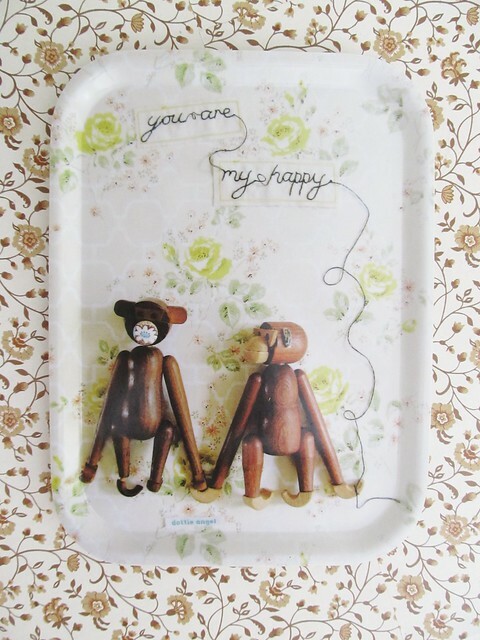 oh I LOVE the lovely monkeys, rescued from the shelves of depair and forever happy. I love Mr and Mrs Monkey.. Thanks to you, sweet Dottie Angel..
Monkeys are my favourite! I would be one if I were an animal - you can be a bit naughty and get away with it because everyone would say "Oh, isn't the monkey sweet!" Hope you had a lovely tea with Grey Cottage Auntie. such a nice litte tray, i had to order it at once! Oh my word Tif this seems to be a match made in heaven. I can see a real future in the matchmaking business for you. You could scour the shelves of despair looking for potential romantic encounters and make subtle introductions leading folks down the path to happiness and wedded bliss. I am sure that Mr and Mrs Monkey would vouch for your complete discretion and professionalism as it looks to me that they are soul mates who just needed a kindly helping hand. If I were on the shelves of despair I would like nothing more than to think you were out there, leaving no thrift shop unturned, finding my perfect other half. Hi there, I had to write and tell you that I just received your book. I purchased it from uppercase and it came in the mail yesterday. What a treat - what a labor of love that this was for you. Every detail is beautiful from the glassine bag at the back, to the photo pasted on the front to the tape strip on the back cover. I have not even sat down to actually read it yet - I am just savoring it and waiting for a comfy, relaxed moment where I can sit and read. In the meantime I am just teasing myself by flipping quickly through the pages. Congratulations - IT IS BEAUTIFUL - I hold it like a work of art and will place it in a key spot on my new bookshelf. I wish you lots of luck with it. Thank you for all the inspiration.! You are SO funny! Does your little clan realize how hilariously clever you are? I always delight in your descriptions of the little creatures you find upon the shelves of despair (and that term! It's perfection!). I wish we were related. I'm not much older than your #1 so maybe you could be my aunt or something. your kind comments have made me most happy on this wet and dreary monday morning. 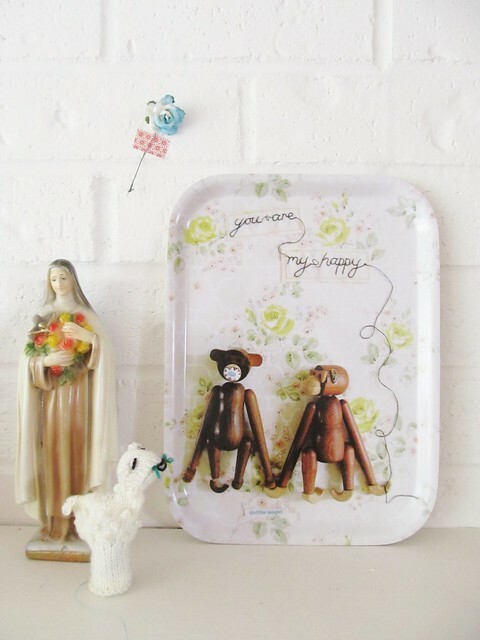 THis is such alovely TraY!My mum is Danish and they have always had one such wooden monkey hanging from the bookcase in their sitting room.Oh and I love your book...I was going to save it for a Christmas but I got really itchy fingers and its now my bedtime read.Thanks! i love them! soooo gorgeous! well done!